Kristian Dennis’ willingness to be a team player has impressed Gary Caldwell since the boss arrived in January. The striker has started the last 13 matches for Chesterfield under Caldwell and scoring nine goals in his first season as a professional has helped him overtake Ched Evans as the club’s top scorer. 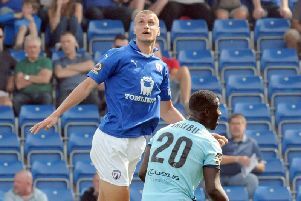 The Spireites manager explained what he liked about the 27-year-old, who was signed last summer from Stockport County: “His sheer willingness to work for the team. “He’s one of those strikers that is first and foremost a team player. “He looks like someone that other team mates appreciate what he does in terms of his workrate, running after lost causes, shutting people down and working for the team. “But not only that, I think he can score goals. Caldwell has spoken of players who struggled to get into the team having failed to make a good first impression on him. But forward Dennis appears to have found favour straight away and then improved his standing in the gaffer’s eyes. “He’s another player the more I’ve been here the more I’ve been impressed with him and you can see it in his performances,” added Caldwell.